Last year the magazine Monocle ran a brief interview with Susan Wiigh Mäsak is a biologist who has invented a new, ecological burial method that is proving instantly popular. Mäsak’s system, called “promession”, turns a body into powder using a combination of deep freezing, vibration and freeze drying. It took her 10 years to perfect the process. The powder is buried approximately 20cm under the ground in a corn starch case and is absorbed into the soil between six and 18 months later. Several countries, among them Sweden, South Korea, Canada and Germany, have expressed interest in the system. I mentioned this years ago in the old Diary. This is the post from 2005. I also wrote about burials in 2002. Why is promession better than a traditional casket burial or cremation? With those [traditional] methods, people’s bodies either rot or are burned. Many people find promession more appealing and less frightening [than something like cremation]. It’s a nice thing to imagine giving new life after your death – to a flower, for instance. It’s also important that we humans don’t destroy nature. Casket burial affects the groundwater negatively and cremation creates problems with emissions. Not more expensive than the other methods. Also, there are no remains left in the ground just a year and a half after the burial, whereas in a traditional casket there are remains even after 25 years. That’s an important factor in places where there is little space available for graves. Where will the first promession facilities be? The Swedish town of Jönköping should start next year, and South Korea has ordered equipment for 10 facilities. There are 10 million people in the capital, Seoul, alone, and they need graves where it doesn’t take decades for the bodies to disappear. 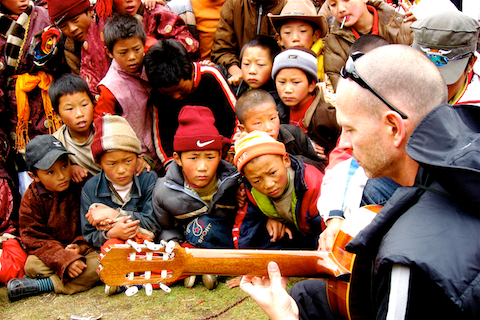 Playing guitar for the kids at the Zhechen monastery college. And everything else is just propaganda! X-ACTO blades instead of photoshop. Nice. Ghostery is a Safari Extension. It detects third party page elements on a website, shows companies tracking you behind the scenes, and controls your interactions with those companies by blocking scripts, images and iframes. I also use this Extension, which shows YouTube videos automatically in the html5 format. Also works with Vimeo.